It took me a long while to make puttanesca – that feisty Italian tomato sauce packed with briny, sharp, spicy, fishy flavors. I confess it was the anchovies. While I don’t mind anchovies, I don’t liberally cook with them either, harboring a childhood timidity toward their pungent fishiness. I should know better: Anchovies are a magical ingredient, a bright star in the cuisines of the Mediterranean and Asia (think fish sauce). When used with restraint, anchovies melt into a dish, amplifying flavor and producing an elusive umami quality that keeps us digging in for more. So in the spirit of the New Year and a kick in the derriere, I made this puttanesca-inspired sauce, and now I am smitten. Goodness knows why I waited so long. Serve as is or tossed with spaghetti. This recipe may be prepared with other shellfish and fish such as clams, mussels, squid or firm fleshed fish filets. Heat 1 tablespoon oil in a large skillet over medium heat. Add the onion and saute until it begins to soften, about 2 minutes. Add the garlic, anchovies and 1/2 teaspoon chili flakes. Saute until fragrant, about 1 minute. Add the tomatoes, olives, white wine and capers. Cook, stirring occasionally, until tomatoes begin to break down and sauce thickens, about 20 minutes. Taste for seasoning and add a spoonful of sugar if needed. Keep warm. Heat 1 tablespoon olive oil in another skillet. Add 1/2 teaspoon red chili flakes. Arrange the shrimp in one layer in the skillet and season with salt. Cook until pink on both sides and just cooked through, 3 to 4 minutes, turning once. Arrange the shrimp on a serving plate. Spoon the puttanesca sauce over and around the shrimp. Garnish with parsley and serve immediately with crusty bread. I love this version of that classic Italian dish. A perfect combination. Nice dish. Puttanesca is one of my favorite Italian sauces. Instead of using whole anchovies, I use anchovy paste as I am usually just cooking for two people. You managed flavor and healthy in same beautiful cast iron pan. I know it’s like that sometimes – you wait and wait and finally make something and it’s so fabulous you wonder why you waited so long. Crazy, but this looks like it was well worth the wait!! 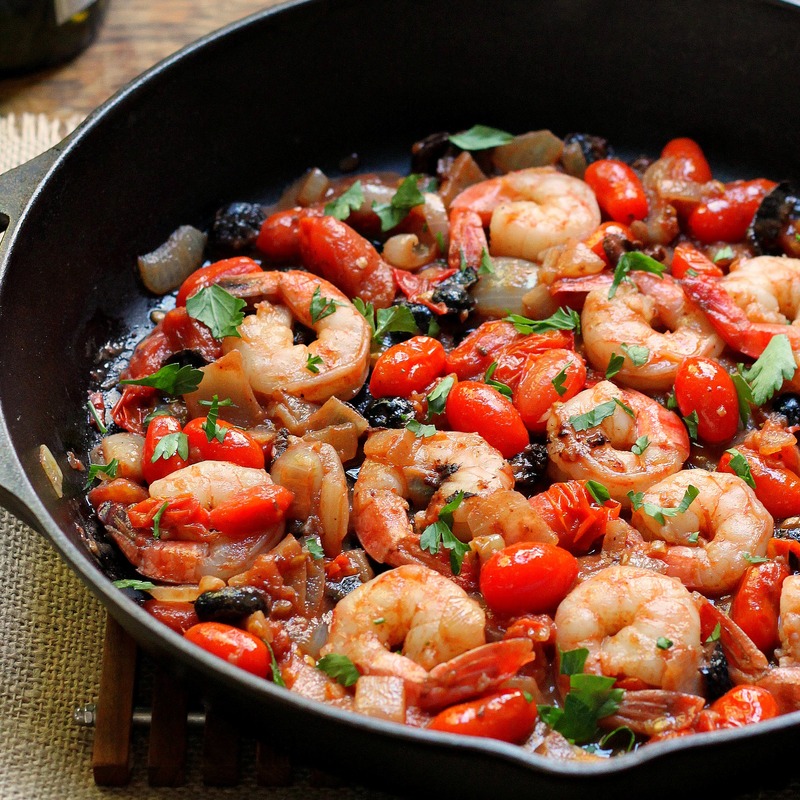 I haven’t made Shrimp Puttanesca either but as a lover of shrimp I need to try this recipe! The intense flavors make for a radiant weekend dinner, well done! I prepared this last night. Simply fabulous. Thanks for a great dish. Thank you for letting me know – so glad you liked it. I always shy away from using anchovies for the exact same reason, exposed to too much bagna cauda as a kid, I guess. This dish looks too good not to follow your lead, thanks for the push. Making it right now. It looks and sounds delicious! This is a delicious recipe! I made it tonight, and we all loved it. I’ll made it again soon.